This first one I burned, out of an elm stump, ended up holding about 5 gals of water! It took about 2 days to burn into it that far. I used the primitive method of rock-boiling to cook up a feast of crawdads, shrimp, and clams. It sure was good!...Forgot the butter though. Note the tongs made of an elm branch I used to move the hot rocks into my water to get it to boil. Here is a way to make use of an old stump or log. 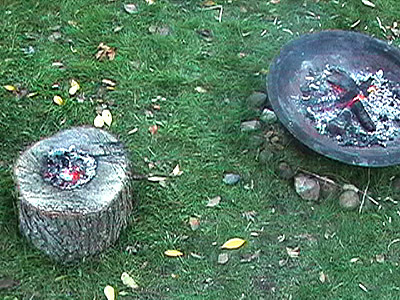 Using coals from your fire you can create a water trough, or cooking pot. Coal-burning is by far easier for making depressions in wood than trying to carve them with a knife or sharp stone tool. 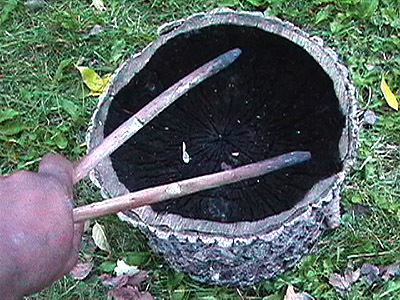 Wooden bowls, cups, pots and spoons can be made through this process using hot coals. 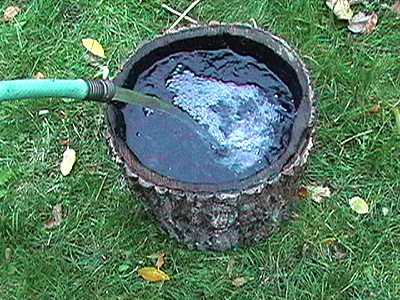 This method works best with dry wood obtained from a log, stump, or other chunks of wood. There are two ways in which to keep the container from absorbing food material that will start to spoil. One is roasting the inside with pine pitch mixed with wood ashes. If you're going to be boiling water in it with hot rocks, the pitch will soften and give your tea or stew a pine flavor. A better method is to seal it with double-rendered fats (tallow). After each cleaning, add a little fat to seal it to keep it from cracking. WARNING: Be sure the log you intend to use is not a poisonous species like yew, cascara, or some types of locus. "Pitchy" species like pine can also make your food or water taste funny. 1). 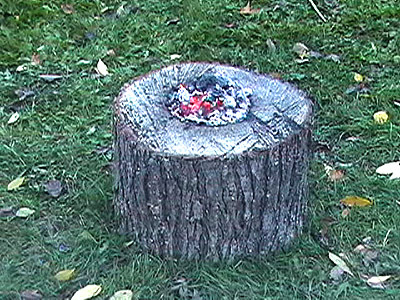 Create a fire and add coals to the top of your stump. 3). Once the coals have burned down. Remove any remnants and use a sharp-edge rock or knife--the Trackr Knife edge tip works great to scrape away the char. Add more coals..maybe a little more this time...then repeat the process of burning then scrapping until you have reache the desired width and depth. This was about 5gals of water. 4). It doesn't hurt to create some tongs to move your coals onto your stump. 5). 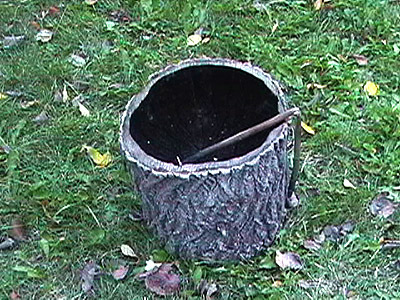 Finished utility stump! Ready for cooking or storing possibles.